Pew Research Foundation recently established its definition of millennials as people born between 1981 and 1996. Defining generations helps researchers see how coming of age during certain historical events and technological changes influence the way people see the world. 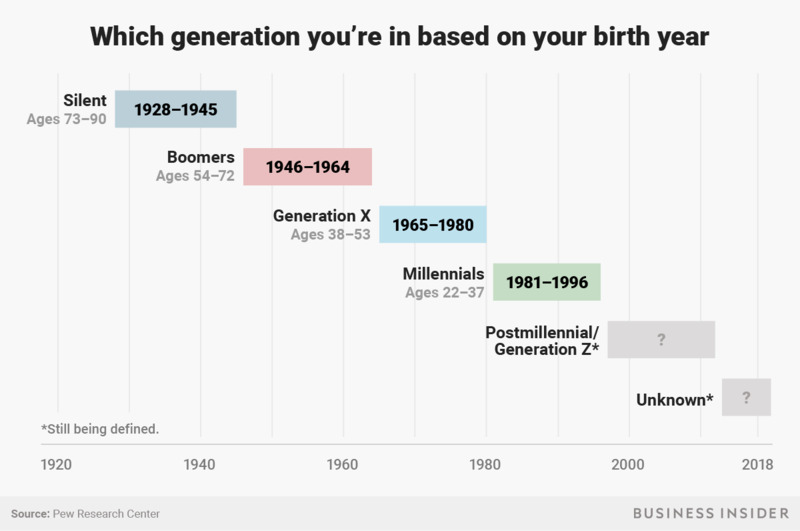 Pew thinks it’s still too early to define the generation that comes after millennials, but some names tossed around are “postmillennial generation” and Generation Z. The only generation officially designated by the US Census Bureau is the baby-boomer generation. Yet that hasn’t stopped demographers from classifying other cohorts into ranges of birth years. Often this is done to better understand how formative experiences such as world events or technological changes shape the ways people see and interact with the world. In an explanation of that decision, Pew president Michael Dimock wrote that generations are better viewed as a tool for understanding how perspectives and views change – not as strict categories that define who people are. Older millennials and younger millennials probably feel differently about a number of topics, but most were between ages 5 and 20 when the 9/11 terrorist attacks happened. That means that those attacks and their aftermath loomed large as those people have become adults. The number of birth years that a generation includes can vary. Millennials span a 16-year range, according to Pew. The Gen X cohort was another 16-year group, but the boomers had a 19-year range and the silent generation an 18-year range. Picking a cutoff year is complicated, of course, as groups change over time. “[T]he differences within generations can be just as great as the differences across generations, and the youngest and oldest within a commonly defined cohort may feel more in common with bordering generations than the one to which they are assigned,” Dimock wrote. 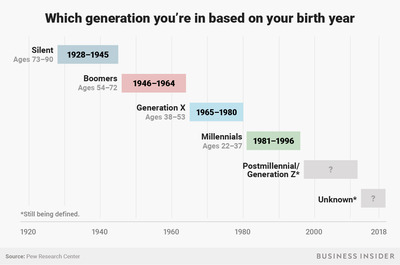 Pew thinks it’s too early to define the generation that comes after millennials, but some names that have been tossed around are “the postmillennial generation” or Gen Z. By the time people born in 1997 or later became teenagers, the US had largely become a place where it was possible to be constantly connected to the internet, usually with a mobile device (the iPhone launched in 2007). While millennials largely adapted to social media and consistent connection to the internet, people born from the late ’90s on probably don’t remember a time without those tools. But the kids being born now will likely be considered part of a new generation after Gen Z.
Dimock said it’s always possible that new data could give researchers a reason to reevaluate these generational boundaries, though. In the meantime, he said, the group coming of age after millennials would be especially interesting to follow.